MarLa studio: Artist Feature: Deborah Maris Lader! Artist Feature: Deborah Maris Lader! In her studio - Deborah Maris Lader holding "A Bird in the Hand" - also wearing the "Sun" and "I have Found the One in whom my Soul Delights"
WOW - Deborah Maris Lader - artist, musician, powerhouse of creation. Founder and director of Chicago Printmakers Collaborative, and member of the indie Alt Folk group "Sons of the Never Wrong". She is the center and force, inspiration and soul, a driving energy in Chicago's art and music scenes. Deborah's art is shown and collected internationally. "Sons of the Never Wrong" tours to sold out crowds, and plays the coolest, most prestigious venues in the country. After meeting her, the term "self-actualized" had a picture to go with it. I met Deb several years ago when I was a printmaker at CPC's first location. It was in a rough space in the pre-gentrified raggedy East Village neighborhood. I loved everything about the place. She created an oasis of artistic productivity and community, there was nothing else like it. The newer Lincoln Square space is beautiful, more accessible and expansive in it's draw. It's become a beloved, important institution in the city's art culture - not an easy thing to make happen and sustain. Back in December I was part of the CPC annual "Small Prints Show", selling my jewelry for the opening weekend event. Over the course of the heavily attended opening, Deb slowly acquired my work. 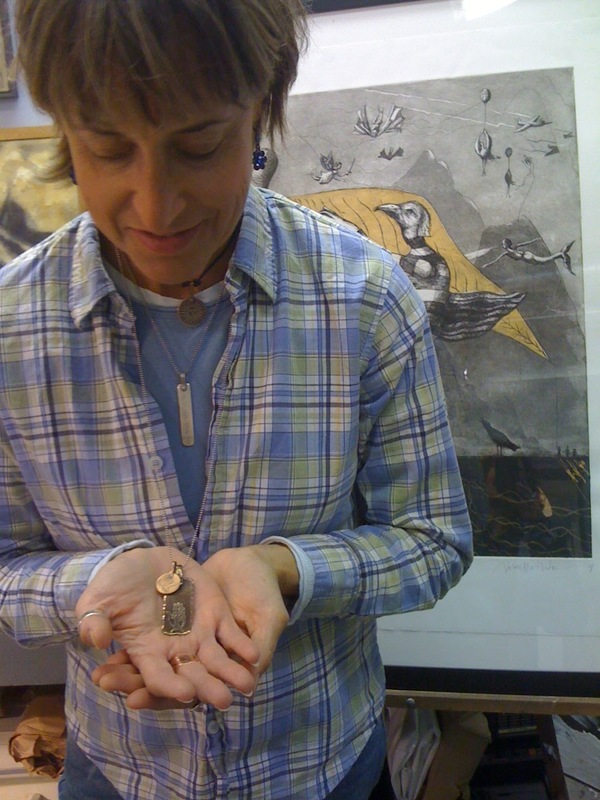 In this pic, layering all her MarLa studio pieces, she's holding her "Bird in the Hand" pendant while the bird in her large etching peers behind her. I love this image. As a serious admirer of Deborah and her work for many years, it is the greatest honor to see her wearing mine. You said it all! "WOW - Deborah Maris Lader - artist, musician, powerhouse of creation..."